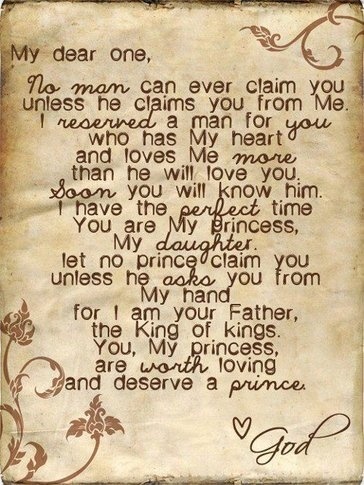 You are chosen and loved by the King of Kings! You have been selected for an inheritance. Simply reply to such-and-such email. Now I know this is spam. But it made me think of our inheritance in Christ. And just what we as children of God have coming to us – both now and in the future! When we got adopted by Daddy God our family changed. Our inheritance changed. In the past we many have been broke – but now our Dad owns it all! In the past we many have been sick – but now our brother Jesus is Health and Healing. I’ve had a few of those emails – deleted immediately. I have been promised a real inheritance, that of eternal life, through my Lord, Jesus Christ. I couldn’t ask for any more than that.